If you’ve not listened to this song, then you should. I have never ever been to a pick your own farm. In 33 years. Nope. Never. Until Saturday. It’s apparently a childhood tradition in the UK to take your kids fruit picking at some point. Be it apples and pears or strawberry and blackberries. But I didn’t grow up in the UK and by the time I moved here, I still hadn’t been. I’ve always wanted to, just never gotten round to it. This weekend we had friends come to stay. I suggested visiting a pick your own farm which was excitedly confirmed with our guests. 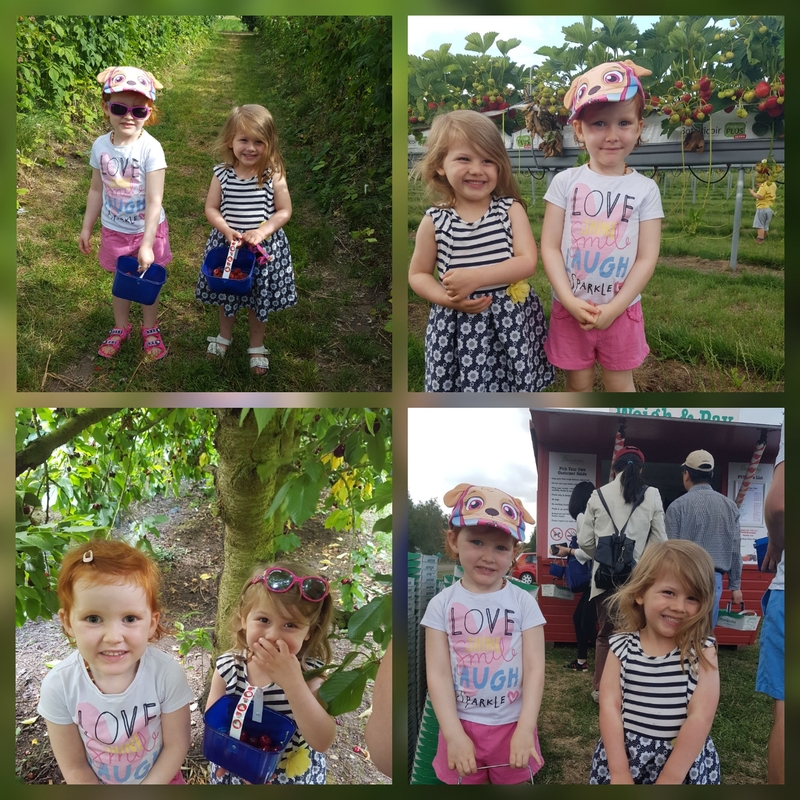 So myself, one of my best friends Sian and our daughters went fruit picking. We steered clear of the vegetable patches. Ha. Went straight to raspberries which were delicious. Then blackcurrants, which are sour as hell. Ribena they are not! My plan for those is blackcurrant jam. And gin. Then the best fruits ever. Strawberries and Cherries. We ate less than we picked. Because we picked LOADS. They were deliciously sweet and sticky. Will I go again? Oh hell yes. Today I had the unfortunate experience of explaining (again) why shoplifting is not ok.
Emma in her wisdom (after being told she couldn’t have a pair of pink diamanté sunglasses) proceeded to put them in her bag when I was not looking. I caught her. I told her off and she cried and to the rescue came a small boy about the same age. Declaring he’d save Emma because he was…. spiderman. A proper little knight in shining, well, spiderman persona. He kept asking her if she was ok and then telling me he was spiderman. He then proceeded to lead Emma to protection. At the point Emma was confused and I was trying not to laugh and little boys mum then came over. He then declared he was off to the lift but do be careful because it’s dangerous.